I check my watch and rush through the entrance of Starbucks, scolding myself for being late. The door slams behind me as if in agreement of my tardiness. Will Esther be uncomfortable in a setting full of strangers in a time foreign to the young queen? I pray she hasn’t given up on me and left. Giggles erupt from the corner and my gaze darts to discover what commotion has interrupted the other patrons. I gasp. Three girls surround Esther, eyes fixated on the queen as she speaks. Her animated face tells me she’s in the middle of one of her spellbinding tales. I chuckle. How could I have doubted her? The coffee aroma lures me and I approach the barista. I order a decaf cinnamon dolce latte as more giggles fill the background. I fumble with my money and loonies tumble from my wallet, rolling out on the counter. Way to go, clumsy Darlene. My cheeks flush. I mumble an apology and pay for my drink. I walk with my head down by the others waiting in line, hoping they hadn’t seen my klutzy move. Why do I let my fears of what others think get the best of me? I make my way to Esther’s table. Today she’s dressed in a royal purple gown, lavished with gold beading around the bodice and sleeves. Perfect for a queen. The jewels adorning her neck sparkle in the lighting. The girls thank Esther and wave on their way out. “The time Xerxes tried to cook for me. It was a disaster.” She rolled her eyes. She sits back and runs her finger along her teacup. The barista arrives with my latte and I take a sip, waiting for the queen to gather her thoughts. The café hushes in response to her comment as if they hear. My earlier brush of panic at the counter surfaces along with my week of insecurities. How could I not face my own piddling fears when Esther went up against death? Tears pool in my eyes and I blink them away. I nod but can’t speak. The barista comes to take our dirty cups away. I’m thankful for the interruption to clear my thoughts. Can you relate to me in this story? 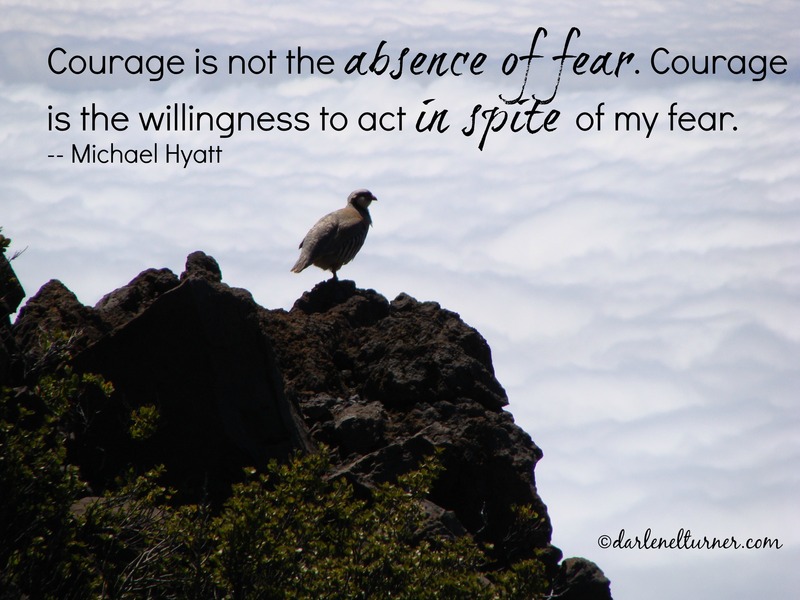 Do you suffer from fears? Insecurities? Let’s choose to face them. Will you stand against them with me and have a courageous heart? I know it won’t be easy, but we can do it together! Give me your comments. I would love to pray for you. Darlene, This is awesome. I love how you use story telling to bring out biblical principles. You make Esther so real. I want to come next time you meet with her! Sure come along, Krista!! 😉 Thanks for stopping by. Wow Dar…this interview is captivating! I feel I am at another table drinking my frappicino listening in and waiting for her response of your every question to her. This is such a neat way to share her testimony from scripture. I love how your questions relate to us as woman today..our fears…concerns…insecurities. We do have a lot to learn from the ladies of the Bible. Love It!!! Can’t wait to see who you talk to next! Wow Dar fears and insecurities all things that can truly paralyze us. But God is greater than all of them. My strength and my drive and my security are all the holy spirit working in me. God loves me so much so hard to believe. I love you so much Dar. You are such a gift from God… my angel! Fears and insecurities are huge and Satan uses them big time! You’re right…God is bigger than all of them. Love you too. Thanks for stopping by!